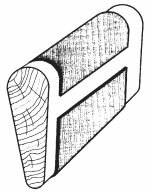 The outside of a gouge is sharpened on conventional bench stones using a kind of rolling movement. This technique requires some practice but provides good results. 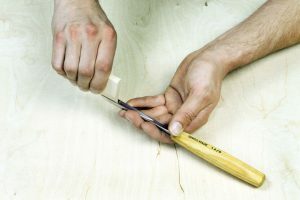 Depending on the degree of wear (nicks), you will either need to pre-sharpen the gouge on a roughing stone or just hone it on the sharpening or honing stones. The insides of gouges are normally polished by the manufacturer, so it should be sufficient to hone them on an 8000 grit multiform stone. Hold the gouge with one hand and move the stone with the other from the inside outwards towards the cutting edge. Let the stone rest on the inside surface and make straight movements. Gouges and turning tools are often polished with leather on the inside and outside, either by hand on a so-called strop or on a machine, e.g. the Tormek. 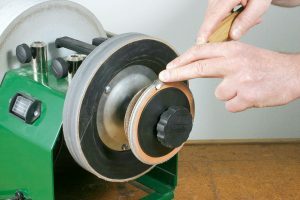 The Tormek provides (as an accessory) a profiled leather honing wheel (No. 705227) that makes polishing very quick and easy. 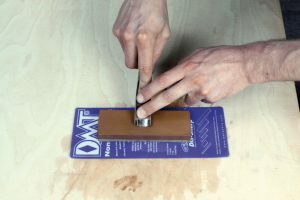 V-parting tools are laid down on the outside bevel and moved along the sharpening stone, similar to paring chisels. It is important that pressure is only applied to the bevel, so that the bevel angle does not change. You must also make sure that you remove the same amount of material on both sides to ensure consistent blade geometry. Use a multiform stone for honing the inside as shown above. If the edges of this stone are not sharp enough, you can work on the sharpening stone first. During sharpening of the V-tool, a small projection (nose) often forms in the middle of the cutting edge, because the blade is thicker in this angle than on the side walls. To prevent the unwanted projection, you should therefore round off the angle slightly before sharpening. edge when you polish it.